» Home » Politics » Croatia in NATO on April 3, 2009. NFCA newsletter. » Home » Events » Croatia in NATO on April 3, 2009. NFCA newsletter. Washington, DC: The Republic of Croatia's accession to the North Atlantic Treaty Organization (NATO) as a full member was officially accomplished today when Croatia's Ambassador to the United States, Kolinda Grabar-Kitarovic, delivered the Croatia Parliament's ratification instrument of NATO Accession to the U. S. State Department. Formal ceremonies will take place at the annual Alliance Conference later this week in Strasbourg, France and Kehl, Germany. Ironically, this historic event for Croatia falls on the 60th anniversary of the NATO Alliance's formation in 1949. NATO was conceived after World War II as an organization of like-minded democracies committed to a mutual defense against aggression. In so doing, NATO provided equal protection to all nation-state members, large as well as small. Throughout NATO's history all member countries have enjoyed peace and prosperity while under the formidable defensive protection of the world's most powerful military organization. Today's event marks the achievement of Croatia's top foreign policy goal and completes a process that the National Federation of Croatian Americans (NFCA) has worked on for many years. All Croatian Americans should be grateful for the acceptance of Croatia into this elite group as its 28th member. Long live Croatia! And long live NATO! As we celebrate this wonderful occasion, there are many that the NFCA would like to thank for their leadership and enduring dedication to this achievement. The political leadership of Croatia, including the diplomatic corps in the U.S, that set this goal early on after it won its war for independence and stayed with it through difficult times. The Croatian people who supported it even after experiencing frustrating barriers that slowed down the process. The U. S. State Department and its Ambassador to Croatia, Robert A. Bradtke, who was uniquely prepared to provide the Republic of Croatia qualification guidance based on his prior State Department experiences and for his timely appointment and special devotion to Croatia. Croatia's military that had to transform its old fashioned services to modern hard-hitting expeditionary forces to meet NATO standards. Thanks also go to the Members of the U. S. Congress who took time to recognize and acknowledge Croatia's democratic progress in their resolutions and many other statements of support. Congressmen George Radanovich (R-CA) and Peter Visclosky (D-IN) – the Chairmen of the Congressional Croatian Caucus -- and all of their supportive Caucus Members and respective legislative staff members who were so helpful to the cause. The NFCA especially thanks Congressman Elton Gallegly (R-CA), Congressman Dana Rohrbacher (R-CA), recently deceased Congressman Tom Lantos (D-CA), Senator George Voinovich (R-OH), and President George W. Bush who kept his promise to lead the charge for Croatia within NATO. Appreciation also goes to Vice President Joe Biden and Senator Christopher Dodd (D-CT), who as acting Chairman of the Foreign Relations Committee for him, drove the Treaty ratification process through the U.S. Senate last September at a time of unusual national financial crisis to deliver a positive vote for Croatia's formal NATO accession. And special thanks are directed to our loyal NFCA individual members, organizational members, and friends who provided important financial support and encouragement to our organization over a long period of time so that we could develop and continue our contribution to this great success. The NFCA is the national umbrella organization of Croatian American groups that collectively represents approximately 130,000 members. For additional public affairs information, please contact Mr. Joe Foley, NFCA Government and Public Affairs Director, at (301) 294-0937. You may also contact NFCA Headquarters in Washington at (301) 208-6650, or by email at NFCAhdq@verizon.net. For recent NFCA newsletters, important NFCA membership application and chapter information, and other Croatian American news please visit the NFCA’s Web Site at www.nfcaonline.com. 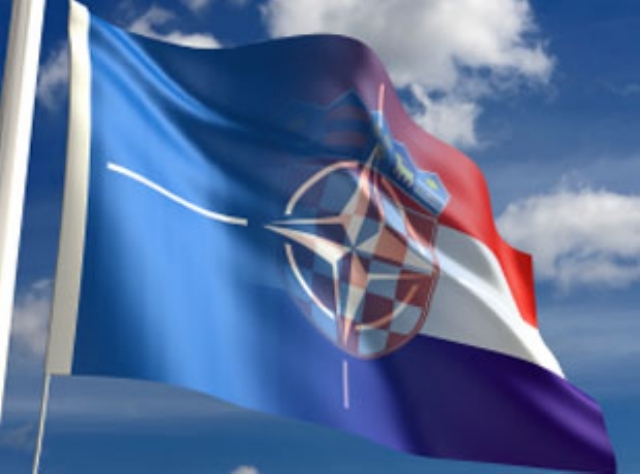 After many years of hard work the Republic of Croatia will join the North Atlantic Treaty Organization (NATO) next week! The NFCA is pleased to have contributed over the years to this great accomplishment for the Old Homeland. While there are other issues that continue to need the work of the NFCA, this is a major achievement! May Croatia long enjoy the peace and prosperity that is a by-product of NATO membership. Thank you for your enduring support! Motif: Digital and Dispersed Map of Croatia and the NATO Alliance Logo The North Atlantic Treaty (NATO) was signed on April 4, 1949. 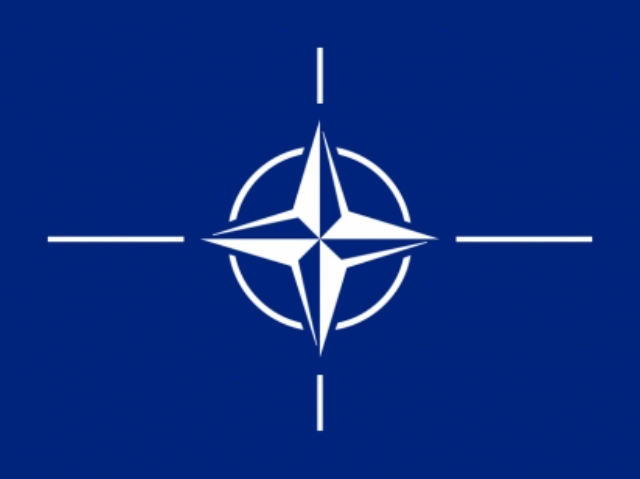 NATO was established at the height of a Cold War when it became obvious that cooperation from the time of anti Hitler coalition was abandoned; and when the Soviet Union in Eastern Europe tried to create a new coalition of nations Ťnational democraciesť and that the Marshal plan and the Truman doctrine served as the basis for gathering those who accepted the Euro Atlantic idea of development and co-operation. The Treaty was signed for an undetermined period of time and consisted of only 14 articles. The provisions of these articles confirmed the freedom and security to all the members, pointing out the need to accept mutual values recognised in democratic functioning of societies. Pursuant to Article 5 of the North Atlantic Treaty Organisation any threat to security to any country member is considered as a threat to any of the other country members, whereby its member states agree to mutual defence in response to any external party. The Alliance is referring to Article 51 of the United Nation Charter where it is elaborated that nothing shall impair the inherent right of individual or collective self-defence if an armed attack occurs against a Member of the United Nations, until the UN Security Council has taken necessary measures. The Treaty anticipates that any European country is given the possibility to become a NATO member under the condition that it be unanimously invited and accepted into NATO and shall deposit the instrument of accession to NATO with the American Government. First signatories of the Treaty in Washington on April 4, 1949 were: Belgium, Denmark, France, Island, Italy, Canada, Luxemburg, Netherlands, Norway, Portugal, USA and Great Britain. Turkey and Greece became NATO members in 1952; The Federal Republic of Germany in 1955 and Spain in 1982 after deposing General Franco’s dictatorship, In the years of the Cold War, NATO had a strong defensive role and the military dimension was at the forefront. However with international tensions subsiding some changes in international relations were announced and the so called Harmels report in 1957 pointed out a political unity of the NATO members. During the détente years NATO members would be an important actor in the Conference on Security and Cooperation in Europe (OESS) process and also after the fall of the European socialist system in 1989 and SSSR. In 1991 NATO remained the sole military and political alliance in Europe. Almost all of the Eastern European countries, except Russia and Belarus, applied to be accepted into NATO and the intensive process of the NATO expansion had begun. After Clinton organised a Partnership for Peace in 1994 as a preparatory stage for the accession to NATO, the first new members in 1999 were Poland, the Czech Republic and Hungary. After March 2004 Bulgaria, Rumania, Estonia, Latvia, Lithuania, the Slovak Republic and Slovenia became full members. At a meeting in Bucharest in 2008 the invitation was extended to Albania and Croatia and the process of Macedonia’s accession to NATO was placed on hold until the subject of the official name of Macedonia shall be resolved. NATO functions on the principle of inter-government co-operation, and decisions are adopted by a consensus, on the basis of consent among all the member states. Full sovereignty is preserved of all the member states including their independence even at the price that the democratic principle in some cases slows down actual action. The headquarters of NATO is in Brussels, and the Military Committee in Mons (Belgium). Although Croatia placed as a goal in the foundation of its foreign policy documents the accession to Euro Atlantic Integrations: NATO EU, it was only after democratic changes began in 2000 that Croatia was invited to Partnership for Peace and the Euro Atlantic Partnership Committee. That same year, Croatia became a member of PARP (Process for Peace Planning and Review) and only the year after that NATO accepted the first Croatian individual partnership program. In 2003 Croatia along with Albania and Macedonia signed the American-Adriatic Charter, evidence that the USA is backing the accession of the three states in NATO. By fulfilling all the criteria stated in the Membership Action Plan (MAO) Croatia received an invitation in Bucharest for meetings in Strasbourg and Kiel on 3-4- April 2009, which will enable Croatia to become a full member of a democratic, industrialized and far reaching Western World! 3 Croatians presently presidents of 3 countries. (E) NATO: A CLUB WORTH JOINING? (E) NATO and ... once we conquer our fears ...Croatian identity!